In the early 1980s, a new period in the debate on modern human origins began, focusing on two alternatives, the Multiregional Evolution model and the Out-of-Africa hypothesis. Over the last decades, new hominid discoveries, absolute dating, and other evidence have supported the latter view which proposes a recent common origin of modern humans in Africa. The increasing evidence made the idea of long-term regional evolution up to modern humans in Europe and Asia, following the first expansion out of Africa at nearly 2 Ma, more and more unlikely. Only the African fossil record documents a continuous early modernization process. In contrast, the European evidence shows a replacement of the Neanderthals by modern humans. Also, most of the claimed evidence for regional continuity in China and Australasia has turned out to be unsubstantiated. Major questions of the current discussion on modern human origins refer to the evidence for gene flow during the replacement period and to the number of species involved in Middle Pleistocene evolution. 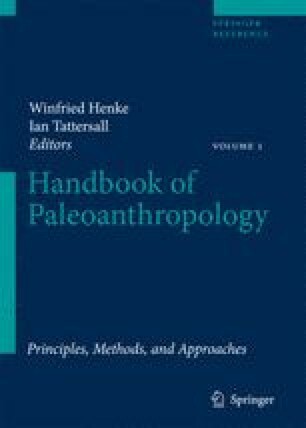 I thank Winfred Henke and Ian Tattersall for inviting me to contribute to this handbook. I am grateful to Fachroel Aziz, Hisao Baba, Helmut Broeg, and Tim White for kindly providing photographs. I also thank Anja Bodendiek, Juliette Kober, Hermann Müller, and Eszter Schoell for their helpful support with the final version of the manuscript. Many thanks go to Mark Collard for valuable indications.